In this colorful excerpt from the Lives of the Artists, Italian biographer Giorgio Vasari provides an interesting detail of the early years of Michelangelo Buonarotti (1475-1564) as a painter: He used a contemporary engraving by the German artist Martin Schongauer (ca. 1445-1491) as the model for his first steps as a painter. 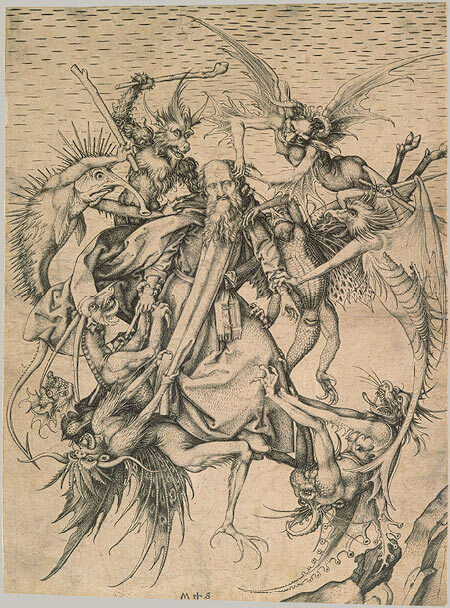 The engraving is one of Schongauer’s earliest prints (he was around 30 when he made it) and depicts Saint Anthony tormented by the Demons. It is interesting to note here that in this case the engraving forms the original work of art providing the model for a painting; in later centuries (especially in the 18th century) prints would be the objet d’art par ecxellence serving as a faithful copy of a painting or a drawing. In the recently opened exhibition Michelangelo’s First Painting, you now have the opportunity to first take a look at the original Schongauer engraving (unique in its collage of fantastic beasts and figures, reminiscent of later Pieter Bruegel paintings) and then decide for yourself whether those fish heads bought at the market indeed surpassed the copies. The Metropolitan Museum of Art, New York: Michelangelo’s First Painting. June 16, 2009–September 7, 2009. European Paintings Galleries, 2nd floor.